#GE17 – What are the parties saying about Mental Health? It’s election day, it is finally here! We aren’t going to tell you who to vote for or label you as “wrong” for disagreeing with us but we want to make sure you have the facts about what the main parties are pledging for Mental Health services if elected. To ensure more people are able to access Mental Health Services, if re-elected, the Conservatives will invest £1.4billion in to the sector by 2020 and recruit thousands more MH professionals. Provide Mental Health training to all new health professionals. Ensure every primary and secondary school has staff trained in supporting young people with mental health and, for those who need further support, reform CAMHS. “Rip up the 1983 Mental Health Act” and bring in the new Mental Health Treatment Bill which has parity of esteem at the heart of it. Improve workplace life for those with mental health conditions. Party-wide commitment to improving Mental Health services. £37 billion investment in to the NHS over the next government, this will not only help fund improved Mental Health services but also ensure the”NHS no longer needs to raid mental health budgets to fill black holes elsewhere”. Mental Health budgets (including CAMHS) will be ring-fenced. Focus more resources on early intervention. Ensure all secondary schools have funds available to provide counselling and support to pupils who require additional support for their mental health. £8 billion over the next 5 years will be invested in to social care to help those receiving help at home. End the NHS pay freeze and reintroduce training bursaries for nurses. Make changes elsewhere in the system to reduce the impact on the populations Mental Health. suggestions being scrapping zero hours contracts and introducing awareness and empathy training in schools to help change the way young people think about themselves and their peers amongst other things. Invest in the NHS to improve Mental Health Services. Invest £6 billion in to the NHS each year with £1 billion ring-fenced for Mental Health Services. Implement access and waiting time standards for mental health care in line with other services such as A&E and cancer treatment access. Make Mental Health education a compulsory aspect of the curriculum. Provide more funding for schools to provide onsite professional support. Provide incentives for employers to prioritise employee well-being. Major investment in Mental Health Services. Continuing to talk about Mental Health to raise awareness and reduce discrimination. Increase the number of Mental Health beds available. Plaid recognise that the use of police cells for those in Mental Health crisis is not acceptable. Fund further research in to treatments so the country can move away from the current “one size fits all” approach. 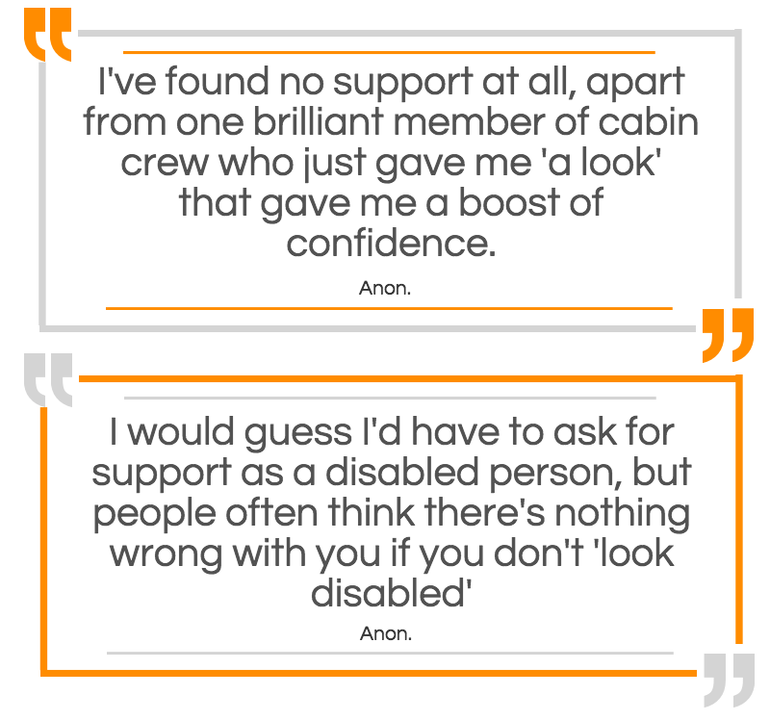 We recently stumbled across a blog entitled “Mental Health and Me: What it’s like to travel with a mental illness” and thought it was worth a share. Travelling often comes up as a barrier to involvement in opportunities amongst our members so, when Airport Parking Shop presented the following figures you can see why the team weren’t surprised. 74% of respondents said yes. You won’t be surprised No was the most given answer. 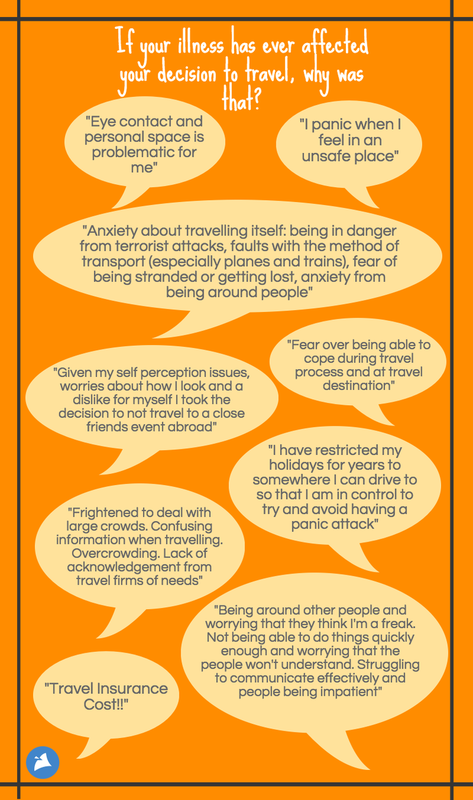 What have your experiences of travelling with mental health issues been? Don’t forget to check out the full blog here for more information, as well as some really helpful tips! This blog was originally written by a BIMHN member and shared on their blog. I remember the first time I climbed the highest mountain in South Wales, I got to the top, refused to move and had a bit of a cry as I didn’t want to carry on to the next hill as it looked ‘too scary’ fast forward 6 years and I was winter climbing the north face of that same mountain! I started going outdoors from a young age, enjoying hill walking with my parents and walking with the Guides. As I got older I became obsessed by music and going outdoors took a bit of a back seat. When my daughter was born I was isolated and alone. I was a young parent with poor social skills, I found being with other parents unbearable and was probably what I now recognise as quite depressed at times. As she got a little older and started to spend her weekends with her Dad I found myself with time on my hands, I began to organise walks for a small group of friends, somehow walking was socially easier, conversation about what was around us came more naturally, there was no great focus on me- I didn’t need to look people in the eye and there was no pressure to talk. We followed a walking guide book initially and I got everyone quite lost at times! I soon started to purchase maps and plan my own walks, although I am still not great at navigation I am a lot better than I used to be. I am an anxious hill walker. I worry about getting lost, about my daughter falling, about being far from help, I’ve always been terrified of exposure. There have been some walks in the mountains where the levels of anxiety has been too much and I’ve had to turn around, but where I have been able to battle through I’ve felt so much better for it. The hills are my quiet space, my safe place, a place to discover and learn. We’ve seen some incredible things in the hills from historic ruins, to rare wildlife and things created by weather such as ice formations. I’ve lost count of how many bogs I’ve fallen into, how many times we’ve been beaten back by the weather, times where we have under estimated our route and marched for hours in the dark (with our head torches), time spent wandering round in Scottish forestry wondering why it doesn’t match what’s on the map. We’ve had a few scary experiences, once where I had to abort a walk due to the beginnings of hypothermia – we dropped down off the mountain into the wrong valley on purpose to get out of strong winds and had a really long walk back to the car, once I’d warmed up enough in a ruined building to continue. Other occasions the weather has turned on us, which can feel pretty frightening in the winter. The bad times build memories though, they strengthen me mentally, they keep me fighting another day. We’ve helped others when we’ve been hiking, on two occasions returning lost children to their parents, giving lost people directions, returning lost items to their owners and even rescuing a chicken and a dog – my daughter loves to recount the stories of those particular adventures! I enjoy the spontaneity of being able to read a map and to walk off path to go and explore something which looks interesting- I’ve had many outdoor swims in the mountains and have also camped there too. One of my favorite ‘dips’ was on Snowdon- we walked up it on a really hot day, starting quite late in the day to go up the Watkin Path, we came down the South Ridge and went back over another smaller mountain (Yr Aran) to pick up the Watkin Path again to take us back down. The Watkin path has a river running beside it and although we’d forgotten our swimming stuff the temptation on a boiling hot evening was too great. On the busiest mountain in Wales we stripped off and jumped into the icy pools, that memory of pure exhilaration will always stay with me. That’s what mountains are about, surprises, adventure and building memories for those bad times when the dark thoughts get the better of you. I’ll end this blog with a photo from my my best days walking – the snow was crisp, it was bitterly cold (-10, back when we had actual winters) The sky was blue all day long and we felt so lucky to be out in the hills. This year, the Mental Health Awareness Week theme is Surviving or Thriving and across Bristol, the focus is on the Five Ways to Wellbeing. Organisations across Bristol are running events between the 8th and 12th for Five Days to Wellbeing with each day having it’s own theme. Here Amelia, BIMHN’s Membership Engagement Officer, shares what she will be doing for the Five Days to Wellbeing. I try to practice mindfulness regularly, I realise this isn’t for everyone but it is something that works for me. On Wednesday, weather permitting, I am planning on going to the park by my office to meditate and take notice of what is going on in my head whilst being surrounded by nature. You can find out more about mindfulness over at NHS Choices. I love learning! I’m always looking for new opportunities to develop my skills and knowledge. Last year I discovered the amazing range of free online courses the Open University offers. I’ve been feeling a little too busy to get round to finishing a sociology course titled “Problem Populations, Problem Places” I started last month so next Thursday, I’m going to get it done! There are loads of events taking place across Bristol between the 8-12 May, you can find all the information here. It was early autumn 2014 when I decided to go out for a casual jog around my local park. Apart from the occasional sweaty five-minute burst on the treadmill, this was the first time I’d attempted to run in quite a few years. Twenty minutes pounding my local streets culminated in me curled up in bed, with a flannel on my forehead, feeling a bit queasy and vowing to never run again. But I did. A few weeks later, my boyfriend had persuaded me to go along to the Ashton Gate parkrun in South Bristol. Again, feelings of nausea came back to haunt me as I dragged my sorry, red-faced self across the finish line. It had taken me so long to get around the hilly course that my boyfriend (who received a serious dose of silent treatment upon my return!) thought I’d got lost along the way. But amid the humiliation, exhaustion and sore knees, I also noticed something much deeper within – a profound feeling of fulfilment and accomplishment. I realised running made me happy, and the more I did it, the better I felt. From that moment on, I have used running as a way to manage my depression, which I was diagnosed with six years ago. Before taking up running, my depression had got a point where I was plagued with constant tiredness, zero motivation, and sinking feelings of guilt and self-loathing. Life felt like it was continuously overwhelming, and I lacked any desire to socialise. But running has helped towards minimising those ‘bad days’ – I am now sleeping better, I am seeing friends more regularly and I am better managing overwhelming thoughts and feelings. For me, running is mindfulness. As soon as I put on my trainers and step out the door, my focus becomes on the wind brushing against my face, my feet navigating the ground and my heart pounding in my chest. It’s my escapism and I love it. I have even been coaxed into several races over the last year – including the Greater Manchester Marathon. It was no easy feat, I tell you! There were tears, laughter, substantial amounts of pain, and maybe even some projectile vomiting (I blame the energy gels!). But 26 miles offered a good few hours of contemplation, and towards the end – with the finish line in sight – I couldn’t help but think of the run as a reflection of my journey with mental illness, each mile representing the years of my life (I’m now 26). I started out well, remaining focused and strong, despite various aches and pains along the way, and then at mile 20 – the age I was when depression struck – I hit the proverbial wall. The following four miles were hellish. I thought the race was never going to end, as I scrambled through country roads with the sun beating ferociously down on my head. Retreating to the roadside and giving up seemed much more appealing than carrying on. But before I knew it, I was passing the 24-mile marker with a renewed sense of energy and hope – the end was near! Clocking the finishing line in the distance was like seeing the light at the end of the tunnel – me finally making sense of my depression and mastering ways to best manage my mood. I’d like to say that crossing the finish line marked the end of my depression, but that would be wishful thinking. Instead, I look at it as marking the start of a new chapter, where I am the one now taking control, not the depression. Running has changed my life – it has strengthened my mind and body in inconceivable ways – and I’m so glad that I gave it a go. I’m 22. I have lost four grandparents, three great aunts and uncles, three hamsters, two dogs, a guinea pig – and my little sister. She was only 20 months old when she passed away – hugging her lifeless body and burying her a week later is something I wouldn’t wish on my worst enemy. That was just over 13 years ago. It’s weird because I remember how excited and happy I was when I found out I was having a little sister, it was something I had waited years for. The 20 months I had with her were the happiest of my life but they were also the calm before the storm – the storm being the deterioration of my mental health. Denial: The first reaction is denial. In this stage individuals believe the diagnosis is somehow mistaken, and cling to a false, preferable reality. Anger: When the individual recognises that denial cannot continue, they become frustrated, especially at proximate individuals. Bargaining: The third stage involves the hope that the individual can avoid a cause of grief. Usually, the negotiation for an extended life is made in exchange for a reformed lifestyle. People facing less serious trauma can bargain or seek compromise. Depression: During the fourth stage, the individual becomes saddened by the mathematical probability of death. In this state, the individual may become silent, refuse visitors and spend much of the time mournful and sullen. Acceptance: In this last stage, individuals embrace mortality or inevitable future, or that of a loved one, or other tragic event. People dying may precede the survivors in this state, which typically comes with a calm, retrospective view for the individual, and a stable condition of emotions. There are obviously going to be criticisms of theories like this because grief is not a one-size-fits-all experience and different people go through the grieving process in different orders with some never going past a certain stage (these problems are factored in to the model). I feel terrible admitting this, but I’ve coped fine – after the initial shock and sadness – with losing all of my family members (and pets), except for my sister. There are many reasons why this may be from self-blame to the fact she was so young and it was too early to say goodbye, especially as it seemed like she was getting better and stronger. After a few years of bottling things up and having a minor breakdown, I gave in and started seeing my first counsellor. I hated her. She was the first of many (OK, so like, nine?) and she was definitely the worst. She was far too forceful and strict with schedules, and progress was seen as targets with dates and time frames … grief is not something anyone should have to put a deadline of learning to cope! I’ve now finally realised that I need to listen to people when they say I need to not keep things internalised. It probably should have been one of the first things I learned but, well, I guess I didn’t want to. Hindsight is a wonderful thing. Remember you are not alone. Even when you feel like no one wants to hear that you are struggling or that you don’t know what to do right now, people are there for you. From my experience, they are often scared to talk to you about how you’re feeling in case you don’t want to talk and get frustrated or resent them for it. It’s a bit of a vicious circle really. Crying is ok. Maybe not as much as I cry, but crying is ok, whatever your age or gender. Society tries to tell us that men aren’t allowed to cry or show emotion. I don’t think it is possible to put in to words how much this stereotype angers me! Not crying is also ok. For the first few years after my sister’s death, I didn’t really accept it had happened, I just got on with life and helped everyone else in my family through this tough time. I cried at first but then that was it for about three years (in which time I only cried over fairly insignificant things like when I broke my wrist and was told I wasn’t allowed to be in goal in hockey), something I know everyone who I’ve become friends with over the last few years would struggle to believe! Don’t rush. Like I mentioned before, grief doesn’t have a time frame. Don’t let anyone tell you that you need to “get over it” or to “hurry up”. Some people will learn to cope with grief a lot faster than others, some people need a few months, others decades and everything else in between so don’t worry, you aren’t weird or damaged! There is help out there. If you don’t feel ready to talk to friends or family or would like some outsider’s support there are so many options out there! Face to face counselling has worked pretty well for me but I know this isn’t for everyone. There’s a huge variety of specialist websites now too, online counselling and peer support groups (online and in real life). Don’t feel like you need to break the bond. So, to some, possibly many of you this will sound weird but I wrote letters to my sister several times a month for about two years and still have a toy of hers nearby (this is me admitting this because no one knows I actually have it … oops). This was probably the only good advice my first counsellor gave me, but also it doesn’t have to be anything as time consuming as letter writing. I still do it occasionally but now, I keep her close by having a photo us and my brothers as my lock screen on my phone and iPad. I’d like to just reiterate that this is not professional advice, just a few tips I’ve picked up along my journey. It would be great to hear from others on their experiences and helpful tips in getting through these tough times. Seasonal affective disorder (SAD) – or more commonly known as the “winter blues” – affects around two million people a year in the UK. It’s no surprise when the days become shorter, nights appear darker, and the weather gets much colder. So, to help us through this often dreaded time of year, BIMHN has come up with five ways to help lift spirits and beat those troublesome winter blues. Large amounts of stress and anxiety can be caused when things start piling on top of us. So, by keeping organised, we can attempt to alleviate any of this unnecessary strain on our lives. If you’re balancing a number of different jobs or have various tasks building up, we’d recommend creating a timetable of your week. Allocate days and time slots to certain jobs – this allows you to focus on one task at a time, and helps banish any feelings of work overload. Keep track of any plans you make in a trusty diary and for those busy days, make a ‘to do list’ – there’s nothing more satisfying than ticking off those dreaded tasks! We can often give ourselves a hard time for having bad days, and not being able to get out of bed at a reasonable hour. “I shouldn’t be feeling like this” or “Why can’t I just feel normal?” can be some of the troubling thoughts running through our minds. But what if we were just to accept that it’s a bad day, and allow ourselves to feel ‘off’ish? Laze on the sofa, put on a cheery film, eat comfort food – it is okay to feel this way, and the feeling WILL pass! As studies indicate, maintaining good social connections with friends and family can reap many benefits for mental health. Keeping in touch with friends and family reduces feelings of loneliness and isolation, and helps lift mood. Call a family member you haven’t spoken to in a while, or invite a friend over for a cup of tea – these gestures (no matter how small or large) can help you feel a whole lot better about yourself, and do wonders for your self-esteem. As human beings, we tend to put a lot of pressure on ourselves, whether it’s in our work or social lives. We constantly expect ourselves to be performing at our best – at ALL times! Pressure is particularly high after Christmas, when we feel that we have to adhere to ‘New Year, New You’. But when we don’t live up to the sky-high standards we have set, it can leave us feeling disappointed and judging ourselves harshly, which certainly does no favours for our mental health! Try to lower your expectations, and anything positive that comes your way will be a pleasant and lovely surprise. When life gets hectic, we often forget about someone very important… ourselves! Put some time aside each day – whether it’s just a few minutes, or a couple of hours – to focus on that number one person in your life. Run yourself a bath, cook a healthy dinner, do some exercise, read a book, meditate – all of these things have nourishing qualities… It will be like giving yourself that nice, big hug you truly deserve!